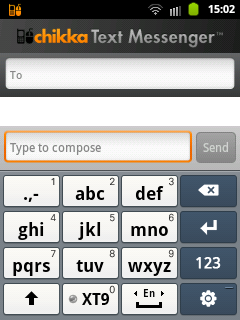 You can send text messages even if the receipient of that message don't have chikka application installed on his mobile. The receipient don't need to be connected in a Wifi or data connection. The message can be receive on their phone as a normal text message without charging them. The message can be received even if the recipient have zero balance on their prepaid or postpaid SIM card. There is a credit given per pay and per receiver. The total number of messages that you can send per receiver per day is only 8 messages. You can send another 8 messages for the same receiver and the same day as long as the receipient of the message reply to you via the number you were using in your chikka account. There is a maximum of 160 characters per message. In the credit given above, you can only send 32 text messages to SMART Subscribers per day, 30 for GLOBE and 20 for SUN.